U.S. Presidential candidate Hillary Clinton addresses supporters during a rally at the UFCW union hall in Buena Park. Clinton is on the second day of a four-day swing through California, ahead of the June 7 primary. This entry was posted in Local News on May 25, 2016 by Jeff Gritchen. U.S. Presidential candidate Bernie Sanders address supporters at the Anaheim Convention Center on May 24, 2016. This entry was posted in Local News on May 24, 2016 by Jeff Gritchen. The Seal Beach Municipal pier remains closed Monday morning after a fire destroyed the former Ruby’s restaurant on Friday. The restaurant, which closed in 2013, was completely destroyed in the blaze. This entry was posted in Local News on May 23, 2016 by Jeff Gritchen. 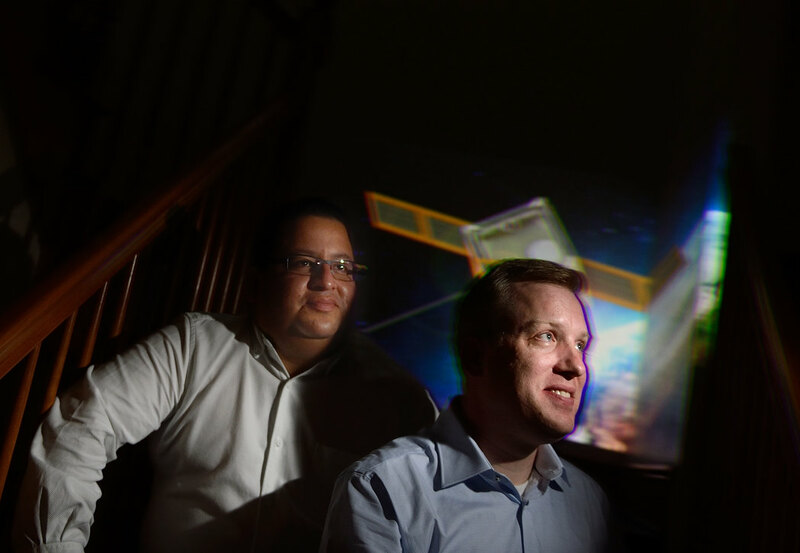 Kain Sosa, left, and Brent Freeze, are spearheading a program where teams at Irvine high schools build a satellite that will be launched in to space from Russia. Students at each of Irvine’s high schools are teaming up to build and launch a miniature satellite a year from now. It would be the first such launch by high school students in the U.S. The project is the brainchild Sosa and Freeze, who have gotten the interest and support of folks from NASA/JPL, local tech and communications firms, and seed money from Irvine Public Schools Foundation. This entry was posted in Local News on March 11, 2016 by Jeff Gritchen. Denver Bronco’s quarterback Peyton Manning rides down Main Street USA with his twin children, Marshall and Mosley, during a parade to celebrate their Super Bowl win on Monday in Anaheim. This entry was posted in Uncategorized on February 8, 2016 by Jeff Gritchen. Workers raise a giant in preparation for Odysseo in Irvine. The tent, called The White Big Top, is 125 feet tall, higher than the Sleeping Beauty Castle in Disneyland which is 77 feet tall, and is about the size of a football field. The tent seats 2,000 people for the show, which combines equestrian arts and high-tech theatrical effects in live performance. The White Big Top is the largest traveling tent in the world. This entry was posted in Local News on January 7, 2016 by Jeff Gritchen. 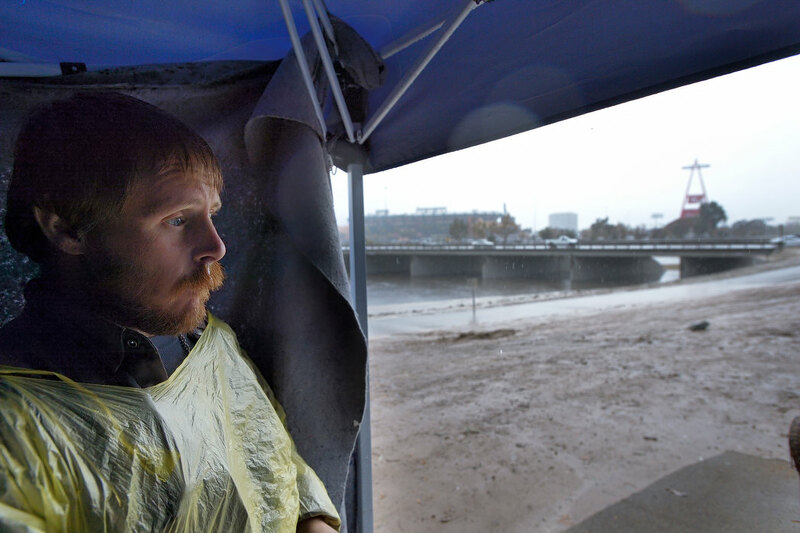 In the shadows of the Big A, Michael Diehl keeps an eye on the rain from inside a tent along the banks of the Santa Ana River in Orange on Tuesday. Diehl said he’s been homeless for six months – after exhausting savings on medical bills related to being shot in the head in 2009. This entry was posted in Local News on January 5, 2016 by Jeff Gritchen. This entry was posted in Local News on November 25, 2015 by Jeff Gritchen. Works grad land south of Glenn Ranch Road near Saddleback Ranch Road in Trabuco Canyon as seen from the Foothill Transportation Corridor (SR-241) on Wednesday. Lands Holdings Corporation recently purchased Portola Center South, a 569-home housing development in Portola Hills. The company is the newest homebuilding firm to locate into Orange County, moving its headquarters to Irvine last January. Landsea is a wholly owned subsidiary of a top 100 homebuilding firm in China, which is diversifying its holdings by expanding into the U.S. market. 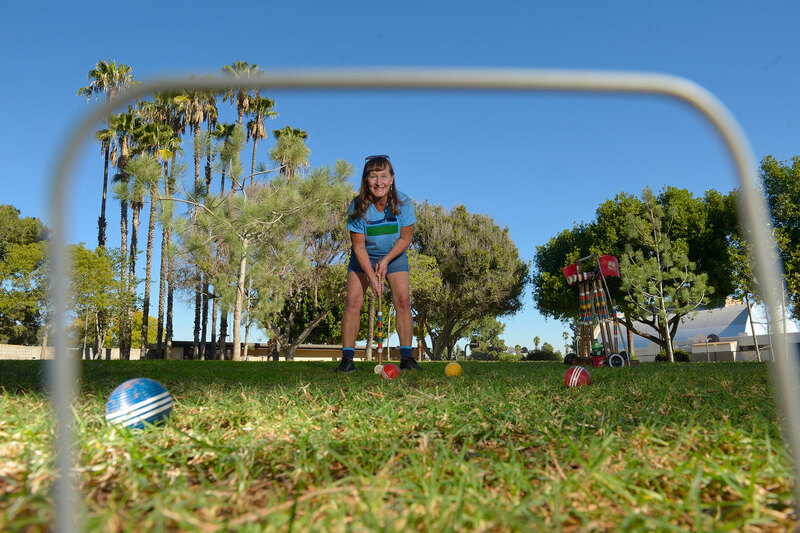 Susan Sutter swings the mallet at Brookhurst Community Park on Monday in Anaheim. About 20 years ago, Sutter started the family tradition of playing croquet after Thanksgiving dinner. They ate at her Anaheim home then played down at Brookhurst Community Park. Her family has grown and gone different ways. This year she’s eating with friends putting on dinner for those without relatives. Sutter is hoping to convince them all to play after dinner. This entry was posted in Local News on November 23, 2015 by Jeff Gritchen. 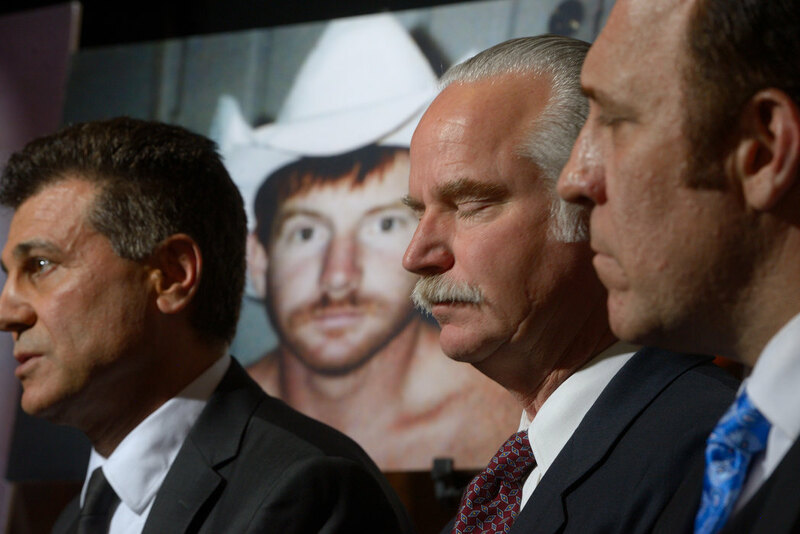 The attorneys discussed Thomas’ settlement in the wrongful death case against the City of Fullerton, the Fullerton Police Department, and the Fullerton Police officers involved in the July 5, 2011 incident. 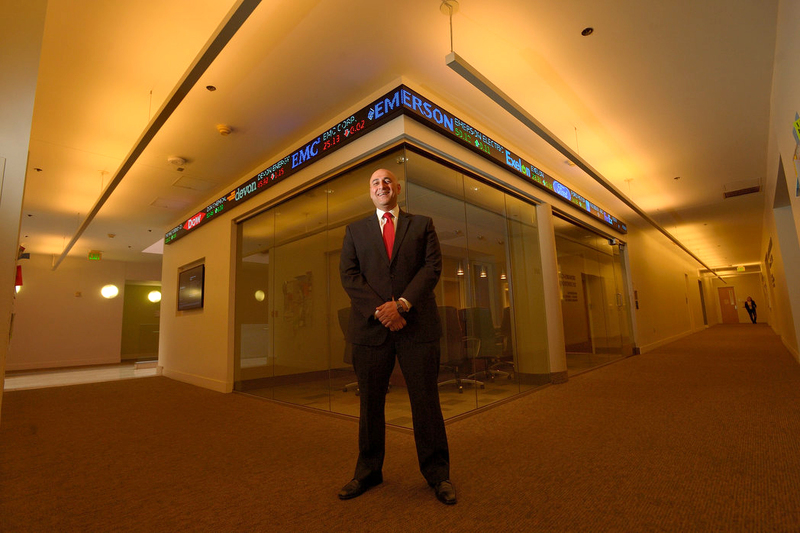 Associate professor Fadel Lawandy at the Janes Financial Center at Chapman University in Orange. The business center is part of Chapman University’s Argyros School of Business and Economics. Highlights of the center include a live stock ticker and a dozen Bloomberg terminals. This entry was posted in Local News on November 19, 2015 by Jeff Gritchen. Dennis Bronson, right, joins other members of the Huntington Beach American Legion Post 133 Honor Guard as they practice their firing squad routine on Friday. The men are getting ready to perform at the city’s Memorial Day ceremony at the Pier on Monday. 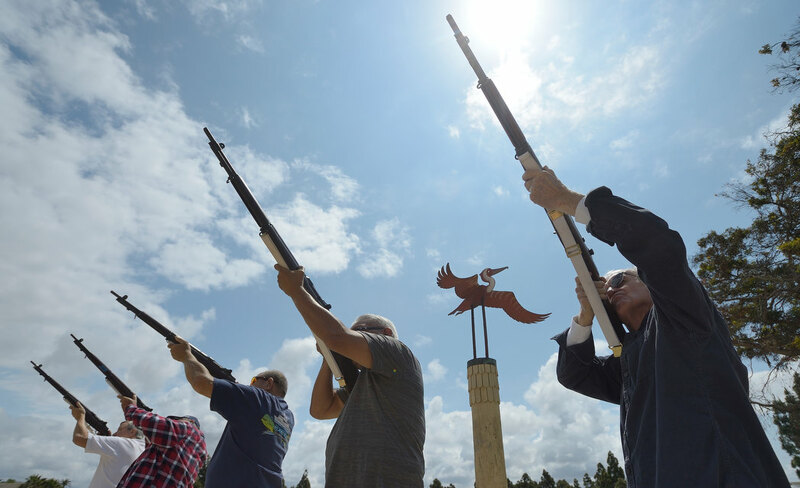 The group fires a 21-gun salute and plays Taps. This entry was posted in Local News on May 22, 2015 by Jeff Gritchen. 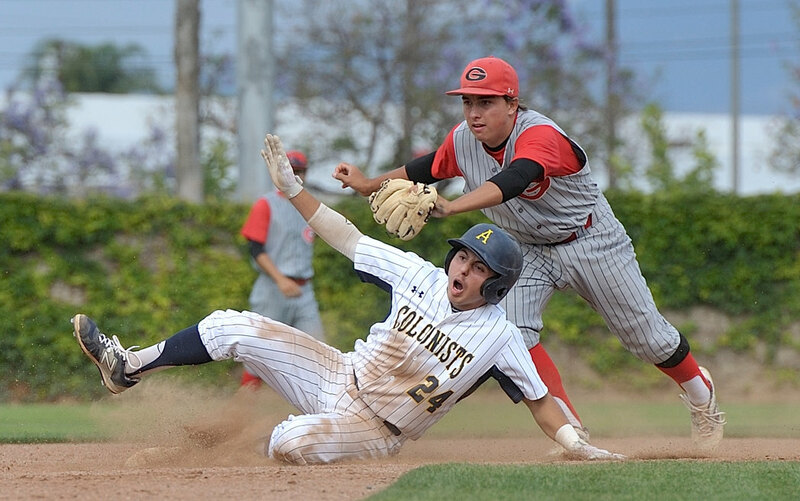 Anaheim’s Ryan Aguirre slides in to second base as Grace Brethren’s Ty Isbell fails to hold on to the ball to tag him during their first round CIF playoff game in Anaheim on Friday. Anaheim defeated Grace Brethren, 2 to 0. This entry was posted in Prep Sports on May 22, 2015 by Jeff Gritchen. This entry was posted in Local News on May 21, 2015 by Jeff Gritchen.